What do Mark Zuckerberg, Philip Kotler (widely known as the Father of Modern Marketing), and Justin Bieber have in common? Through these three influential figures, we can get a better understanding of what purpose is and why it is so important in business today. Let’s start with Facebook’s CEO, Mark Zuckerberg. In May 2017 Mark Zuckerberg gave a speech to Harvard graduates. His speech was about purpose. What exactly is purpose? Before moving on let’s reconfirm the meaning of purpose. If you look it up in the dictionary, there are usually two main definitions. Purpose is the answer to the question, Why are we here?, Why does this exist? We see here that not only is purpose a goal and a reason to exist, it also embodies a sense of a high noble cause. As Mark Zuckerberg points out, finding purpose and having purpose is a given today. It’s the baseline. What we need to look at is how we can build communities and organizations where everyone can have a purpose and realize it. Philip Kotler is often called the Father of Modern Marketing (a pretty awesome nickname!). If you have ever taken a class on marketing, most likely you’ve come across the Marketing Mix, a concept by Kotler. The Marketing Mix is a set of four elements to create a marketing plan. The four elements are Product, Price, Promotion, and Place (channel). I’ve added to the 4P’s a new P. You know the 4P’s is what marketers put together in a marketing plan; they have to describe the product, the price, the place, and the promotion. So the fifth I’ve added is purpose. So why is purpose so important that it got included in to the Marketing Mix? Why is it important in marketing? Why is it important in business? In short, purpose drives business performance. It delivers business results. There are lots of research, reports, and books (there’s a list at the end) that make the case for purpose with plenty of evidence, so I am not going to refer to them here. Instead, let's talk about the importance of purpose from a more fundamental perspective. Have you ever heard of the Golden Circle? It’s an idea by Simon Sinek, a business consultant and author of an inspiring business book, Start with Why: How Great Leaders Inspire Everyone to Take Action. About three and a half years ago, I made a discovery and this discovery profoundly changed my view on how I thought the world worked and it even profoundly changed the way in which I operate in it. As it turns out there’s a pattern. All the great and inspiring leaders and organizations in the world, whether it’s Apple or Martin Luther King or the Wright brothers – they all think, act, and communicate the exact same way and it’s the complete opposite to everyone else. All I did was codify it. It’s probably the world’s simplest idea and I call it the Golden Circle. Why? How? What? This little idea explains why some organizations and some leaders are able to inspire where others are not. Let me define the terms very quickly. Every single person and organization in the planet knows what they do 100%. Some know how they do it, whether you call it your differentiating proposition or proprietary process or USP. But very very few people and organizations know why they do what they do. And by why I don’t mean to make a profit – that’s a result. It’s always a result. By why I mean, what’s your purpose? What’s your cause? What’s your belief? Why does your organization exist? As a result, the way we think, the way we act, the way we communicate is from the outside in. It’s obvious; we go from the clearest thing to the fuzziest thing. But the inspired leaders and organizations, regardless of their size or industry, all think, act, and communicate from the inside out. Let me give you an example. I use Apple because they are easy to understand and everybody gets it. If Apple were like everyone else, a marketing message from them may sound like this: We make great computers. They are beautifully designed, simple to use, and user friendly. Want to buy one? And that’s how most of us communicate. That’s how most marketing and sales are done and that’s how most of us communicate interpersonally. We say what we do, we say how we are different or how we are better, and we expect some sort of behavior – a purchase or vote or something like that. “Here’s our new law firm. We have the best lawyers with the biggest clients. We always perform for our clients – do business with us.” “Here’s our new car – it gets great gas mileage, it has leather seats – buy our car.” But this is uninspiring. Here’s how Apple actually communicates – Everything we do we believe in challenging the status quo, we believe in thinking differently. The way we challenge the status quo is by making our products beautifully designed, simple to use, and user friendly. We just happen to make great computers. Want to buy one? Totally different, right? You’re ready to buy a computer from me. All I did was reverse the order of the information. People don’t buy what you do, people buy why you do it. Great companies excel at their HOWs and WHATs, but that’s only part of the story. What separates them from the other guys is that they have clarity of their WHY, their purpose, and this purpose is always their starting point. Let’s go back to the topic of the Marketing Mix. Similar to the Golden Circle, we can visualize the Marketing Mix of the 5Ps. Purpose, the WHY, would be at the center surrounded by the other 4PS - product, price, promotion, and place. When purpose is the core of all marketing activities, it is called purpose-driven marketing or purpose-led marketing. So what does purpose-driven marketing look like? Let’s take a brief detour and look at a case study of an iconic coffee company, Starbucks. Starbuck’s purpose is: to inspire and nurture the human spirit. Their purpose and these two elements represent a simple and dynamic framework, which they are as a foundation to build and execute strategies. Let me give you three examples. Time for a little pop quiz. Here are two photos of different coffee shops. There is one thing in these photos that Starbucks would never do in their stores. Can you figure out what that is? If you have the time, go to your nearest Starbucks. You'll notice the espresso machines are placed deliberately near the front facing the customers. If you went to a Starbucks in US, UK, Japan, or anywhere else in the world, the espresso machines will all most likely be placed in a similar fashion. There’s an intent behind the placement of the espresso machines. By placing it upfront, customers can see their drinks being made (first key element: their passion for coffee), and they can see the baristas. This means baristas and customers will have a chance of striking up an conversation, which translates to creating human connections, the other key element. This is an example of how purpose is ultimately connected to how a store is designed. If you’ve ever ordered a drink at Starbucks, the baristas most likely would have asked for your name. This makes sure the drink gets into the hands of the right customer, but there is a second intent here. By asking for your name, they are deliberating establishing a connection. It gives the barista a chance to remember your name. It also creates opportunities to make new connections such as by playfully misspelling your name. Have you noticed how everything seems a little impersonal nowadays? We’ve all become user names, reference numbers and IP addresses. That’s why at Starbucks we’ve decided to do things differently. From now on we won’t refer to you as a latte or a mocha, but as your folks intended – by your name. It’s only a little thing. We’re Starbucks. Nice to meet you. In this example, we see how Starbucks linked purpose to customer service. Two years before opening stores in Japan in 1996, Starbucks asked some consultants for advice. At the time smoking at coffee shops were the norm in Japan; non-smoking coffee shops didn’t exist. As a result, the consultants advised Starbucks to allow smoking in the stores if they wanted to succeed. What would you do if you were the CEO of Starbucks? They had a tough decision to make, but they had a purpose-inspired framework to help them. Recall that an essential element deeply connected with their purpose was their passion for coffee. Starbucks prided themselves on the wonderful aroma of coffee in their stores. Imagine if people were smoking in the stores... The smoke would wipe out the coffee aroma. Starbucks would open nonsmoking stores in Japan contrary to what the consultants advised. If you’ve visited Tokyo in recent years, you’ve probably seen a lot of Starbucks coffeeshops. They have a big footprint and have significantly changed the coffee scene in Japan. I hope these examples help paint a picture of what purpose-driven marketing looks like. Starbucks is excellent in their execution, but that’s not the only ingredient. Also as important, their decisions and actions ultimately go back to their purpose of inspiring and nurturing the human spirit. Finally, let’s talk about Justin Bieber. I know you’re probably wondering what does Justin Bieber have to do with purpose. In November 2015 Justin Bieber released an album that went on to be nominated for the Grammy Award for Album of the Year. The album title was, you guessed it, Purpose. I named the album Purpose, and the reason I named it Purpose was because for a while there I feel like I lost my purpose, and I feel like I found my purpose again. Maybe that message is to say that, no matter how far you feel like you are away from yourself or you feel like you don't have your purpose, or you don't know what your purpose is, or you feel like you lost your purpose - there's always room to find that purpose again. I bring up this story because it tells us a very important aspect about purpose. You see, Justin Bieber is not a business person. Other than being famous and talented, he is a human being have a conversation with his fans, who are also human beings, about purpose. When I talked about Mark Zuckerberg and Philip Kotler above, purpose is used in a business and professional context. In the context of Justin Bieber, we see purpose used in a everyday context. This brings us to one of the key characteristic of purpose: it’s used in both personal and professional contexts. Compare purpose with mission and vision. Mission and vision are rigid and businesslike. They are simply not as personal as purpose. 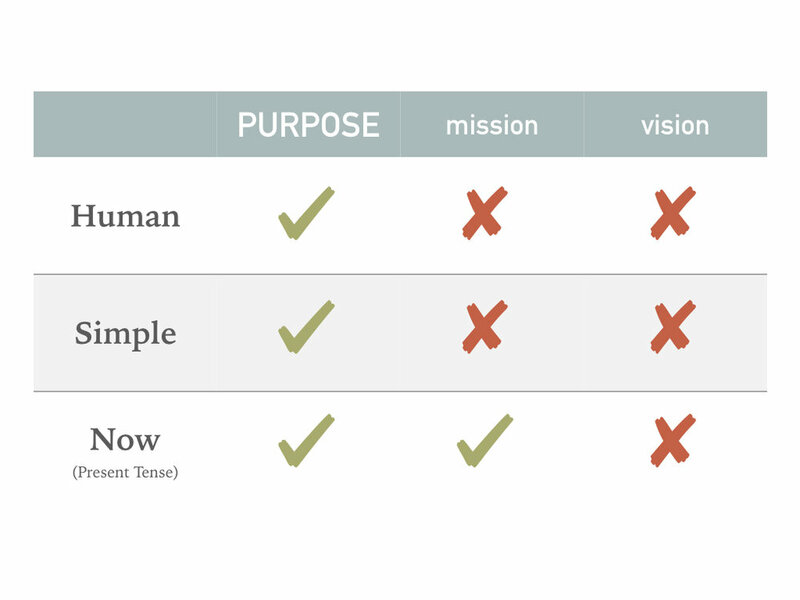 While we’re comparing mission, vision, and purpose, let’s look at them from a few more perspectives. If you asked 100 business persons about what vision and mission is, you’d likely get 100 different responses. The words mission and vision encompass so much in meaning that they’re vague and complicated to explain. On the other hand, purpose is simple and clear. It represents the WHY. Why do you exist? Why is your team here to do the work they do? Purpose is different from mission and vision. There are some great mission and vision out there, but they're future oriented. We're striving to get something, somewhere, someday… Purpose is present tense - here and now. It's why we do what we do. And it's specific. When we put these observations together, purpose is human. It’s simple. And it’s present tense. It is a concept that fits with today. In an era where information and things are in overabundance, we look for simplicity and user-friendliness in the things we experience. In the face of uncertainty and troubled events, we cherish the present and value our relationships with friends and families more than ever. Purpose resonates with our times. The purpose movement is also happening in traditional industries such as banking, insurance, and consulting. It’s also happening in the startup scene. In a presentation from Nick Grossman from Union Square Ventures, a venture capital firm which invested in startups like Twitter and Kickstarter, he explains the importance of linking purpose to strategy in the context of their portfolio companies. The examples above are just the tip of the iceberg. The focus on purpose is apparent across industries and we see it in companies of all sizes and ages. There is clearly a shift from mission and vision-led management style to one with purpose at the core. It is clear that a movement is happening. Companies around the world are upgrading the core of their management operating system to a more modern one where purpose comes first. One of the most interesting aspects of purpose is its dynamic nature. We’ve already seen how purpose can be used in both a professional and a daily context, but it’s versatility does not end there. Purpose works on so many levels and layers: the management level, division level, product and brand level, team level, and even the individual level. What this means is, if you haven’t already, you can embrace purpose in your work tomorrow. Uncover and clarify your purpose and bring it to life through what you do. Good luck on your endeavors and may purpose be with you. I love the word Purpose. Like my children, I lost my father when I was young. It was not what I wanted for myself; it is not what I wanted for them. But the sun will set and the sun will rise, and it will shine upon us tomorrow in our grief and our gratitude, and we will continue to live with purpose, memory, passion, and love. Purpose is a word that sits side-by-side with beautiful words like memory, passion, and love. I’m currently working on a book about finding and expressing the purpose of your business. You can get a free early look at it here.